Description: A low-growing succulent that grows up to about 10 inches, with fleshy, light green stems and dark green leaves with a semirough texture. Reddish-pink streaks are sometimes found on the undersides of the leaves. Tiny flowers rise up above the rest of the plant on short, soft stalks; once pollinated they form slightly adhesive seeds that look like poppy seeds and cover the stalk. Distribution: In Hawaii this indigenous plant is found in environments from dry rocky areas in full sun to shady mesic forests. In many cases they can be found growing on mossy rocks under larger trees. Once I even spotted 'ala'alawainui growing directly on an asphalt road. It was one of the nicest examples I've ever seen, because it formed a dense, matlike covering -- very cool. Today this plant exists naturally on all of the main islands except Kahoolawe, although it most likely grew there in the past. Landscape use and care: This plant looks great as an accent around large landscape stones or as a bedding plant. Full sun is OK but partial shade is better. In full sun, 'ala'alawainui will require a little more water than it would in partial shade. When used as a bedding, space plants about a foot apart, as this plant does not spread much. 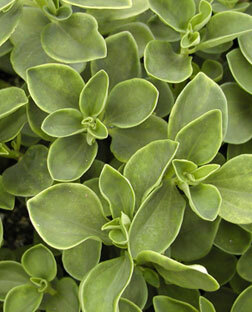 Few pests are known to bother this plant, but I have seen slugs munch on the young offshoots. The plant is available now at Home Depot as well as at Hui Ku Maoli Ola native Hawaiian plant nursery for $6. Cultural uses: A rich, gray dye for kapa can be made from the ashes of this plant.